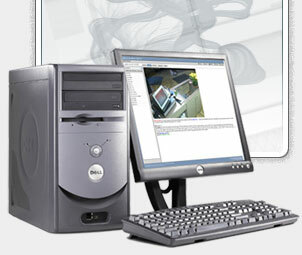 byRemote, Inc. (www.byremote.net) has a network of Partners who are authorized to resell our Video as a Service (VaaS) products and services. 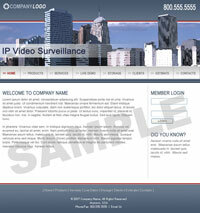 Many partners needed a web site just for their network surveillance business. We have designed the following templates with the byRemote partners in mind. However, these same templates may be modified for any business in the surveillance industry wishing to get their online presence up and running as quickly as possible. Select from the different templates with matching business cards and other design services below. Template Design #1 is designed with a city skyline in the header. The header image can be replaced with the skyline of your choice (if available). Template Design #2 is designed on a white background and is our most popular design among our partners. 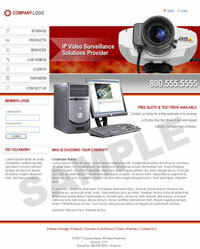 The header image uses a very prominent Axis IP camera on a multi-color red background. 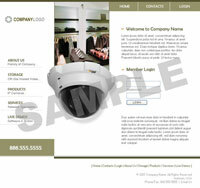 The background color scheme can be changed to match your corporate colors or logo. 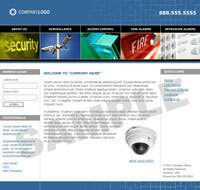 Template Design #3 focuses on the security industry. This template would be good for security companies who offer a full range of services. The dominant color of this template is aqua blue, but it can be changed to reflect your own corporate identity or match your logo. Template Design #4 is an ideal design for a company who does not have a lot of text copy but would like to make a bold statement on their site. The use of different shades of olive green and grey offer a professional look, but the color can be changed to reflect your own corporate identity or match your logo. Template Design #5 is another take on our popular Template Design #2. It offers a simple layout design and more room for text. The use of different shades of blue and grey offer a professional look, but the color can be changed to reflect your own corporate identity or match your logo. The table below lists our template design packages. 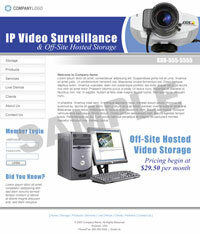 Please download our byRemote Design Services Price Sheet PDF for a full listing.